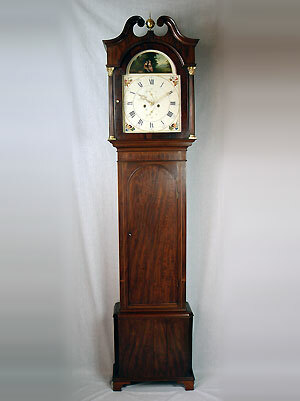 This is a late 18th century boxwood strung mahogany longcase clock by Burton-Kendal of England, the falseplate signed William Whittall. The hood has a swan-necked pediment over freestanding reeded columns with Corinthian.capitals. The straight-sided trunk has an arched door, the base with canted corners, moulded rail and bracket feet. 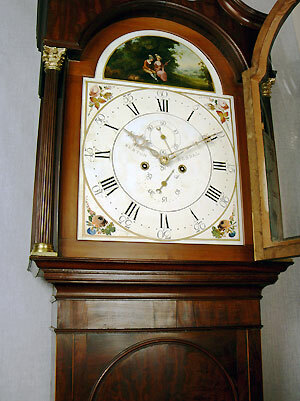 The 14 inch dial has a painted country scene to the arch, with floral spandrels, subsidiary seconds, a calendar dial and Roman and Arabic chapters. The movement has an anchor escapement and rack-strike on a bell.